There are various concepts for designing a photo collage online. Some service providers offer only a workspace, onto which every photo, picture or text can be added. For most customers, however, photo collage templates are the easiest way to create their own collages in an attractive layout. We offer a wide range of photo collage templates on our webpages. 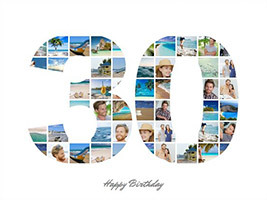 More than 300 des igns ensure that everyone is guaranteed to find the perfect photo collage template for their project. In addition to standard collage templates, collages with texts and heart photo collages are very popular. Moreover, there are numerous design templates that can be used for different themes or occasions. These photo collage templates are used, for example, to produce beautiful gifts for weddings, birthdays or as a love collage. Did you know? How many photos do you want to use? 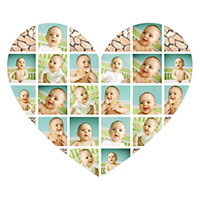 Use our grids for up to 100 photos. The picture collage templates differ in the amount of photos used. From just a few photos to up to 100, there is a wide range of picture collage templates to choose from. 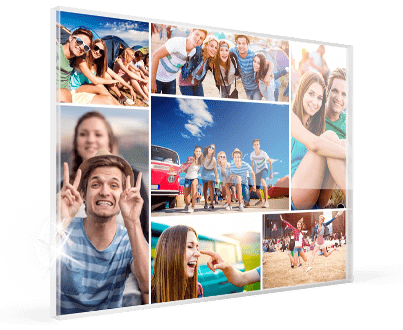 The cheapest way to print all of your photos is the photo collage poster. 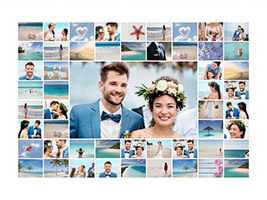 But in choosing, you should remember: The more photos you use in your collage template, the larger the format of your printed collage should be. 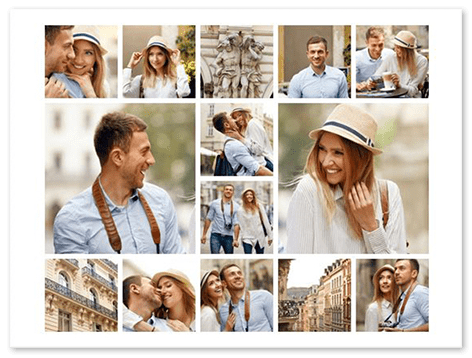 We recommend Alu-Dibond for a photo collage template with many photos. On other materials, the many small photos in the photo grid may be harder to make out.